Discussion in 'Digital Photography' started by -hh, Aug 6, 2006. I'm still picking through my Tanzania stuff. I have a "final" crop in mind, but I'm very much open to suggestions. Your original's not really sharp enough to withstand a lot of cropping if you're thinking of printing. Here's the shot I'd have been looking for, just tidied up some of the clutter below the birds tail. I would crop it just a little to move the bird up to the upper 1/3 line and the right 1/3 line. I love shots like this though. Feels like I can hear the calling. I miss nature living in a town. The birds we get end up starved and leave. Even the park next to us doesn't have much wildlife...thats for being stuck in an industrial city I guess. I quite like it how it is, but I did the below, which is pretty much what mkrishnan and Maxiseller suggested. I'd be interested to see the original shot though. I prefer Lau's. I don't think there's enough detail on the bird alone to make it the focal point of the picture so you need the somewhat interesting shapes on the tree to balance it out a little. I too would like to see the original to get some more context on the image. 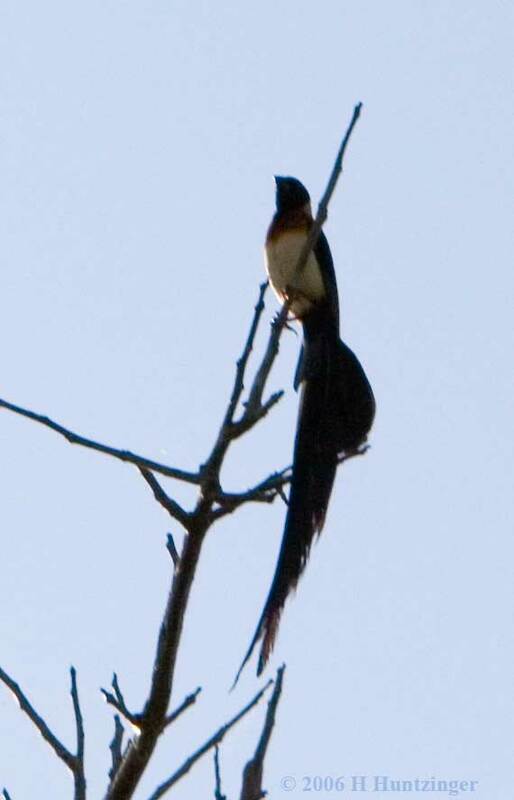 First, I've found out that the bird in question is known as a Long Tailed Paradise Whydah (male, in mating plumage). For those curious about the original, here's a full-size (and closer cropped) before adjustments and after adjustments in Photoshop. IMO, its pretty plain to see that this is too much cropping/magnification. Lau's crop is the best and is what I'd do as well. Lau's or your most recent one works best.